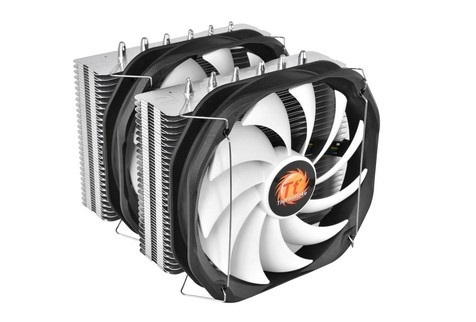 ThermalTake rolled out a new line of processors coolers; the Frio Silent Series. It consists of the Frio Silent 12, Frio Silent 14 and Frio Extreme Silent 14 Dual (pictured below). Non-Interference Cooling Design: Frio Silent 12 and 14 solves the co-existing problem on high performance RAM and CPU coolers, it achieves the best RAM clearance allowing user to easily install high-end overclock RAM with CPU coolers. Performance Optimized Design: Optimized 0.4mm aluminum fins are designed not only for distinctive looks but also for rapid heat dissipation. Tower side flow design optimizes the cooling performance. Heat Conductivity: 3 x ?8mm solid cooper heat-pipes dissipate heat effectively allowing maximum heat conductivity. Heat-pipes are in Direct Contact with the CPU to ensure fast and efficient heat dissipation. PWM and LNC in One: A 120mm/140mm PWM fan is fitted to enhance airflow to produce impressive cooling performance up to 1400RPM/1200RPM. LNC (Low Noise Cable) can reduce 38% noise level. Ultimate Air-Cooling Solution: With dual fans and 6 x ?6mm solid-copper heat pipes, the Frio Extreme Silent 14 Dual accelerates heat transfer from the CPU onto the copper base for a faster dissipation. Dual PWM Fans: Two 140mm PWM fans are fitted to produce high air flow in silence, with speeds up to 1200RPM. LNC (Low Noise Cable) can reduce the noise level by up to 38%. Dual Tower in Aluminum: Optimized dual tower 0.4mm aluminum fins are designed for both a distinctive look as well as performance. The tower-side flow design optimizes cooling performance by increasing the connection between hot and cold air. Mirror-Finish Copper Base: The copper base makes a perfect contact with the CPU, ensuring fast and efficient heat dissipation. 6 x ?6mm solid copper heat pipes dissipate heat effectively, enabling maximum heat conductivity.